Jim Clemens Vol.23: Western South of Birmingham. Jim Clemens Collection No.23. A video film of JIM's travels around BIRMINGHAM and south thereof, eventually reaching SWINDON and onto some Wiltshire branches. There is coverage of the main line south of Birmingham Snow Hill through Hatton to Leamington. Early film of an SLS 56xx class hauled tour to Henley in Arden. 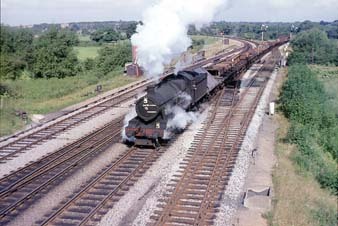 Standard Class 2 hauled normal journey from WOLVERHAMPTON to STOURBRIDGE via Round Oak. Bordesley steam and plenty of SNOW HILL steam scenes. Visit Tyseley shed and just for interest, the 1500 panniers at Coventry Colliery. The North Warwick line is traversed in 1968 by a DMU showing the journey and all the stations in great detail. South through FENNY COMPTON to BANBURY and a visit to the ironstone quarries there. In 1963 a visit to SWINDON works with the last King Class 6018. Other visits there show County class and a Clan. A little of the M&SWJR to Swindon Town. The HIGHWORTH branch, Farringdon, Malmesbury, Marlborough, Savernake and Calne. A very varied programme with some rare scenes on which much of the railway was Great Western. Motive power ranges from panniers to Kings, Prairies and Counties.